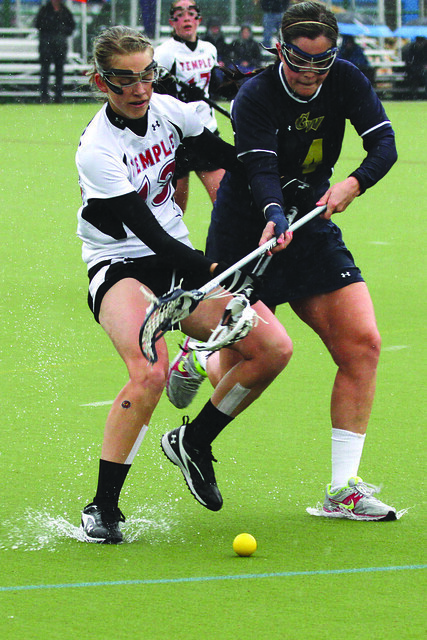 Senior attacker Ann Stouffer will make the switch from Geasey Field to the health insurance field. Graduating senior attacker Ann Stouffer of the lacrosse team has always been near the top among her student-athlete peers academically by making the most of the time she has away from the field. In her sophomore-through-senior seasons with the Cherry and White, she has been on the President’s Honor Roll for having a grade point average higher than 3.5. During her sophomore and junior seasons, she placed in Temple’s Trustee Ten, a ranking of the Top 10 student athletes by GPA. The entrepreneurship major’s academic accomplishments have placed her on the Philadelphia All-Academic Area Team and on the Atlantic Ten Conference’s All-Academic Team. On the field, Stouffer scored 27 career goals and 18 assists, while appearing in 54 games for the Owls. She started in every game of her junior and senior seasons and started in 13 games as a sophomore. As a junior, she ranked No. 5 in the A-10 in groundballs scooped with 36. In December, she was offered a job with AEON Insurance Group, which is located near 17th and Market streets. Stouffer accepted the offer and will be working in the health insurance field. She plans to live within walking distance to her Center City job. While working in the city, Stouffer still plans to attend some of her former team’s games and practices at Geasey Field. “I’ll miss talking to my teammates and being able to be outside all the time because I know I’ll be at a desk five days a week,” Stouffer said. The Owls faced the Albany Great Danes (5-2) in their first home game on the newly renovated Geasey Field and lost, 1-0, on Sunday. ¡i wANt briAn dZenis’s babbiE5!